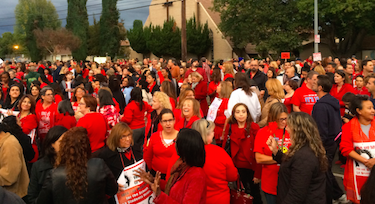 When LA Unified and its teachers union agreed to new three-year deals on a contract and health benefits this spring, one strike was averted. But another may be on the horizon. UTLA President Alex Caputo-Pearl took the stage over the weekend at the union’s annual leadership conference and made another strike threat in his State of the Union address, predicting that the district would try to rollback health benefits when they reopen negotiations in 2017. While it may appear that Caputo-Pearl just likes saying “strike,” he doesn’t have to squint too hard to see the writing on the wall: several district leaders have said LA Unified will need to rethink its health benefits next time around. The current health benefits contract was given a thumbs up by Superintendent Ramon Cortines and was approved by the school board with a 6-1 vote in April. But in its press release announcing the deal, the district pointed out the rising costs of health care for employers. The deal will cost the district over $3 billion dollars over three years, with each succeeding year costing roughly five to six percent more. The benefits package LA Unified offers is among the most robust of any district in the state for including free lifetime benefits for retirees and their dependents. It is one of about 70 districts in California that provides lifetime benefits with no premiums. Most other plans in the state only offer benefits until the retiree turns 65 and becomes eligible for Medicare. Continuing to offer the current lifetime benefits will cost the district $868 million annually for 30 years, the Los Angeles Times reported in March.